West Indies are on fire after their last day performance on second test and first time India look to be on back foot in this tour, before this match Indian bowlers dominate the matches. Now its turn for West Indies bowlers and they all out Indian team to 353 runs, the team who scored 566 runs in first test match and 500 runs in second test match. But it was turn out to be good test match for R Ashwin and W Saha who scored century and help to cross 350 mark to Indian total. 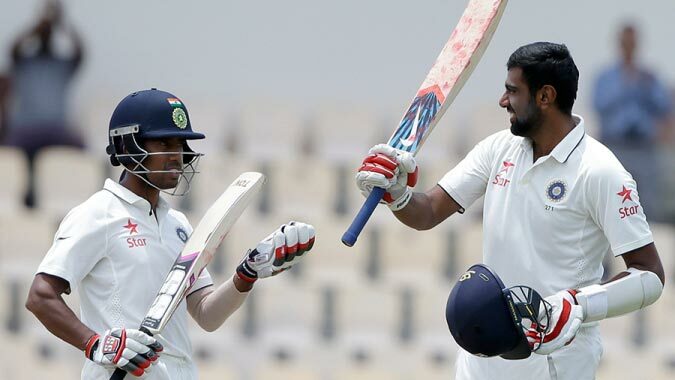 Ashwin and Saha put a 200 runs record stand for the 6th wicket. They start where they lest yesterday. Both put up a 100 runs partnership yesterday. R Sahwin scored 118 runs and complete his 4th ton against West Indies and he did in just 9 innings.Â Only Doug Walters (6 Innings) and Gavaskar (8 Innings) have done this in fewer innings. While Wriddhiman Saha made his maiden test century, he became 4th Indian test wicket keeper to score century in away games. He scored 104 runs in 227 balls. From West Indies side Cummins finally took his first test wicket in his second match and after that he took another 2 wickets and star for the west Indies was their young dÃ©butante Joseph, who took 3 crucial wickets. West Indies batsmen started well in reply of 353 runs their opener first time put up a 50 runs partnership in 3 matches. Johnson fall on 23 runs but after him Kraigg Braithwaite and Bravo played well and put another 50 runs partnership and Braithwaite complete his second half century of the series. At end of the day West Indies score 107/1 in 47 overs and look to be in good position and they eying to score big score as they have great opportunity. First time Indian bowlers will be tested on day-3 of this test match and it was great test match as per viewing purpose both team fight hard.